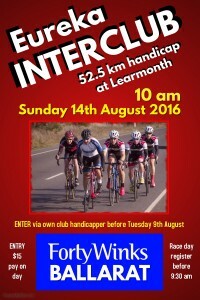 Typical Ballarat sunny skies greeted the 42 riders who converged for the Eureka Interclub race. 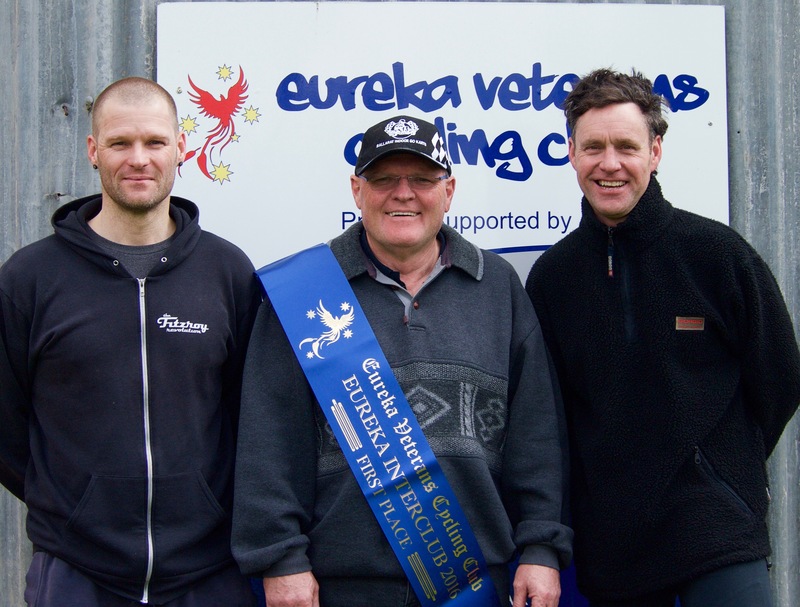 Colac and Geelong riders joined Eureka in a 52.5 km handicap on the Windmill circuit which had a north westerly breeze blowing across it. 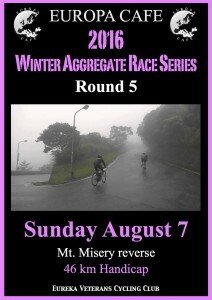 The 4 minute group rode a smart race to fill four of the top five places. They were the largest bunch on the day and caught the 8 minute group by the end of the second lap. The large combined bunch soon had their sights on the leaders and members of the 4 minute group assumed responsibility for the chase. A concerted effort saw them catch the leaders by the crest of Crick’s Hill. This left just eight kilometres to try and shake all the passengers they had picked up along the way. At times the 30 strong bunch were spread out in single file as the pace continued to increase. Riders from the out-marker groups started to drop off the back as the stronger riders kept applying pressure in the wind, however some very fast finishers from the 8 and 12 minute groups were getting a tow to the finish. Into Donovans Road and over the rise for the final time the field was again stretched out as riders started jockeying for position to ensure they wouldn’t be dropped. Inside the final two kilometres an adventurous attack by one rider saw him open a small twenty metre gap which was soon reeled in. 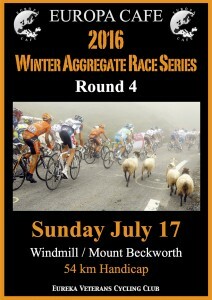 A bunch finish was going to decide the outcome as over twenty riders hurtled towards the finish. Grant Rogers started his sprint early and opened a small gap on Brett Dedman, the two drew away from the chasers with Rogers winning by two bike lengths. A tight group of seven riders crossing the line a further two lengths behind Dedman. Watching the race from behind was the remnants of the combined bunch of Scratch and the 1 minute group. Each group had lost manpower on the first lap and whilst they continued to take ground off the supersized lead bunch, they were never going to catch them. In the end Gary Wearmouth and Tony Luppino fought out a sprint for Fastest Time. A dead heat was declared. In other news… Grant Dawson (1 minute) had a fall just before the turn into Donovans Road for the last time. Grant had dropped off the back of the combined Scratch and 1 minute bunch. An entanglement with Carl Judd saw Grant hit the deck and suffer a broken collarbone and much road rash. Grant insisted on shooting the wind with fellow riders at the post race feed, before finally being coaxed off to hospital. We wish Grant a fast recovery, along with all the other Eureka Vets who are sidelined post crashes, illness and operations. Thank you to everyone who made the trip out to Learmonth today – the riders, spectators, marshals and officials and of course our marvellous kitchen volunteers. Photo L-R: Brett Dedman (2nd), Grant Rogers (1st), Ralph Iselt (3rd). *Round 3 of the Europa Café 2016 W.A.R.S. was cancelled due to dangerous weather conditions. 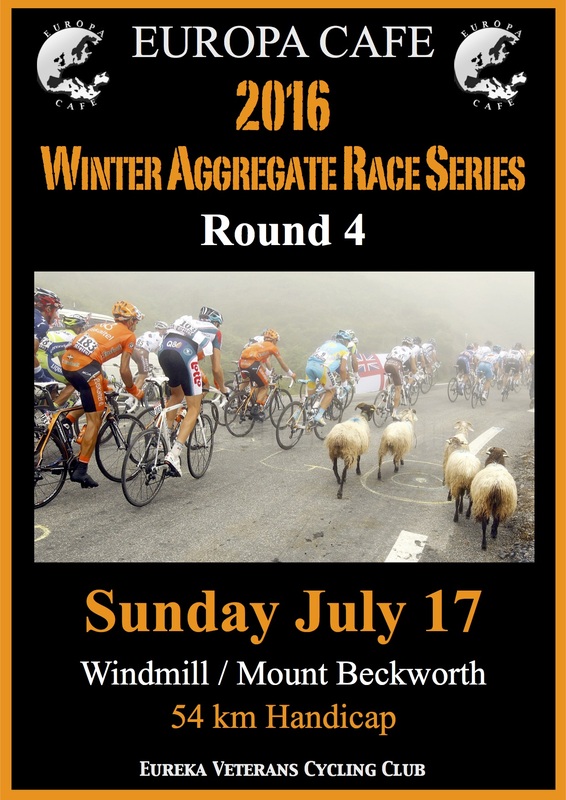 the aggregate will now be decided using the best SIX race results of each rider. In the event of a tie, placings will be determined using a count back system. The “high revving” Damien Keirl demolished all-comers in a dominant bunch sprint – proving yet again that he is the fastest thing on two wheels at Eureka. Winning Race 5 of the club’s Winter Aggregate Race Series (W.A.R.S.) has given Keirl a large lead on the points table. Mild conditions, light winds and the first sighting of swooping magpies. The day favoured the front of the race, however a disciplined performance by the backmarkers rolled the race up 5 km from home. With most of the field closing on the finish line grippo compacto, the Scratchmen were licking their lips and snarling at each other. Mal Rock and Graeme Parker were first away. The two old war horses are showing the wear and tear of years of sporting abuse; crook knees, busted hip, it’s amazing they still want to get on a bike let alone race – such is their love of the sport. They enjoyed each others company and no doubt complained all the way around, but they stayed clear until caught by nearly everyone at Addington. Despite suffering and then being shelled by the peloton, the Limit riders both returned to the clubrooms with big smiles and stories to tell. Chasing the Limit group was the prodigal son of Eureka, John Creek, in his return race. Accompanied by James Gretton they probably had a reasonable show at achieving high placings. It would all probably depend on how they climbed and how much time they gave up in the process. In fact, it was actually a question of how much maintenance Creekie had done on his bike during his lay-off…the answer unfortunately was not enough. A tyre flat for Creekie at the bottom of the climb put paid to his and James’ hopes. In a stroke of luck, the mechanical occurred just as they were being reeled in by the chasing bunches. Seeing Creekie on the side of the road with an inadequate repair kit (spare tube valve stem not long enough for the deep dish wheels), Bob Morley from the bunch behind threw him a tube and a canister. As luck would have it, the “survival kit” unfortunately bounced off the road and hit a *vehicle which was following. The two “rural” occupants of said vehicle took umbrage and a bit of road rage ensued. In a weird parody of a professional easing back to the team car, Bob gently explained what had occurred. The situation quickly diffused and all was well. Bobby’s group of six included three large blokes – Scott Denno, rewarded with a handicap reduction for his recent successes; Mark O’Callaghan, probably the fittest guy in the club; Jason Haire, joint patron of the W.A.R.S. and returning to racing from a long list of injuries and illnesses. Joining the “heavies” were three lightweights – Peter Livitsanis, his elbow has repaired and he’s starting to find form again; Noel Said, the diminutive visiting Northern CC rider; Bob Morely, who is near the upper edge of the “lightweight” scale. Good even rolling turns were the order of the day. Jason endured until half way along Ercildoune Rd but was pretty cooked and dropped off after saying goodbye and thanks…and showing off his brand new bike which is pretty schmick! The remaining five soldiered on, trying to make the climb before being caught. The chopping block Second Scratch group were charging along, holding off Scratch and quickly reeling in Bob’s group in front. Most of the Scratch bunch were in various states of fitness today. More machine than man, Damien “Damo” Keirl was wired up in the ongoing analysis of his heart…or was that telemetry back to the pits for the Renault mechanics? A relaxed Tony Mirabella was just back from a month overseas, the break doing his state of mind the world of good, but the pasta wasn’t helping with the power-to-weight. Brendan “Sheems” Schiemer returning from weeks on the sidelines with a serious bout of life-threatening man-flu. The bunch also included Dean “Kit” Wells and the lean and hungry Grant Dawson who had been promoted (long overdue some might say…particularly those he hammers every week) to join the ranks of Scratch. Congratulations Smokey. The ride up to the chicane was very controlled and quick. Post race we would learn that Damien’s heart was going nuts (that’s a technical term for when someone’s heart rate exceeds 220 bpm) in the first 10 kilometres, so it was quite amazing that he lasted to the end.?? Rob Ellis (corner marshal) called out that Scratch were just 1 minute 20 seconds back at the chicane. So far so good… they had taken 40 seconds off Second Scratch in less than 6 kilometres. Controlled riding was the order of the day for Scratch. Easy on the rises, power down the slopes. Nice easy turns. Closing towards the end of Ercildoune Road it was apparent that they were still over 1 minute in arrears of Second Scratch. ?The time and distance margin tumbled towards the end of Black Bottom Road, but ideally the catch would have been made earlier. Onto the climb and Creekie is on the side of the road asking for someone to organise a lift for him. Wells shouts out ‘Run like Froome’. 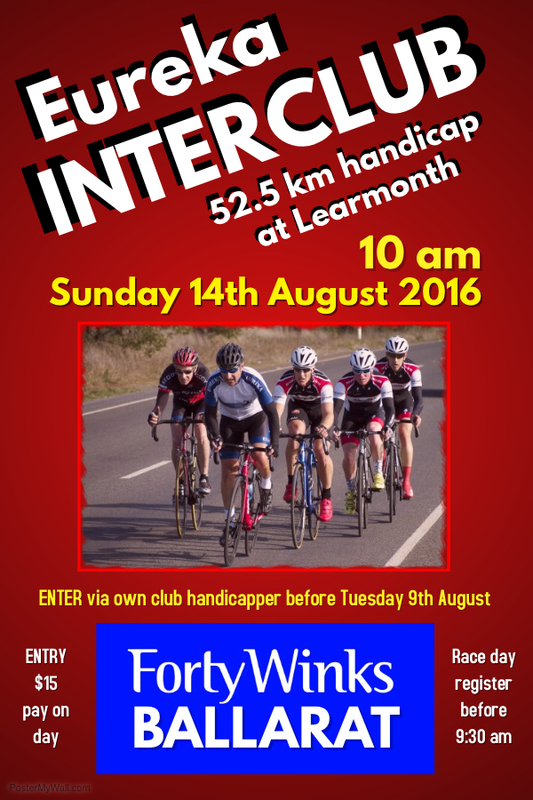 Scratch closes within fifty metres of the 2 minute group. The 5 minute group is just ahead of them. Scratch ease up and let the other two groups join. It is only nearing the top of the climb on Beaufort-Waubra Rd that Scratch finally close the gap and take over the running, but not before Denno goes from the back to the front to do a suicide turn on the front, then pop(!) he’s out the back. Cresting the climb the leaders can be seen up ahead. ? ?No attacks along this section, although Wells rolls off the front before the downhill to Addington. It’s a sharp corner and he wants clear road ahead! Up the Edmonton Rd climb and the two leaders are soon collared. Dawson assumes the pacemaking roll with Wells alongside. Both really just trying to block the road and be in the right place if someone attacks…although Tony was twenty metres up the road for some reason and Rick Calvert is looking edgy. Sheems puts in a burst nearing the top of the climb. A few riders follow, and a few don’t. Wells jumps into the fray and assumes pacemaking as they charge down toward the home turn.?? A car coming the opposite way means the combined bunch has to go almost single file…then a sharp turn which Sheems and Fifi almost overcook. Wells is placed handy to attack – but that wouldn’t be fair after the bunch had to string out for the vehicle leading into the technical turn.?? The bunch regroups with Dedman, Dawson and Calvert all prominent. Kierl is in about 6th wheel as they race down the dip, Andrew Rushton is glued to his back wheel tighter than a tubular tyre, Sheems tried to pinch his spot, but the only way to get onto Keirls wheel was probably under Rushton. Sheems settles for Mirabella’s wheel instead. Wells launches out of the dip hoping to drag some with him. Let’s face it…a bunch sprint should really only end one way (Kierl winning), so Wells is really trying to disrupt a few riders and help a Scratch rider win.?? Most of the bunch is smarter than that (all except whoever followed). The bunch regroups and soon after Keirl launches from a hell of a long way out. It looks like he has caught everyone napping and he has opened a few bike lengths. Rushton comes out of the pack, but daylight is second and Keirl holds a clear margin to the line. Brett Dedman also sprints into the clear to take third with daylight back to Smokey Dawson. Sheems gets over a labouring Mirabella for fifth. Europa Café is located in the Ballarat CBD at 411 Sturt Street. Europa Café is open every day from 7:00am for breakfast and lunch. Europa Café is a spacious, inexpensive family style café, offering a range of tasty treats, hearty meals and scrumptious snacks. 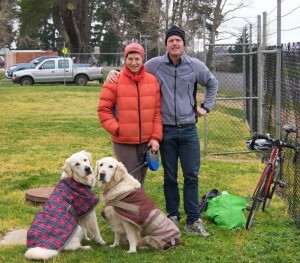 We thank Kathryn and Jason for their ongoing support of our club and the Winter Aggregate Race Series. The winners of EVERY race in the 2016 W.A.R.S. receive a Europa Café voucher. Last years run away winner, Darren Terry, repeated the dose, with almost a replica ride of power and dominance, riding clear in the finale to take a second GP Doug Garley trophy home to the pool room. 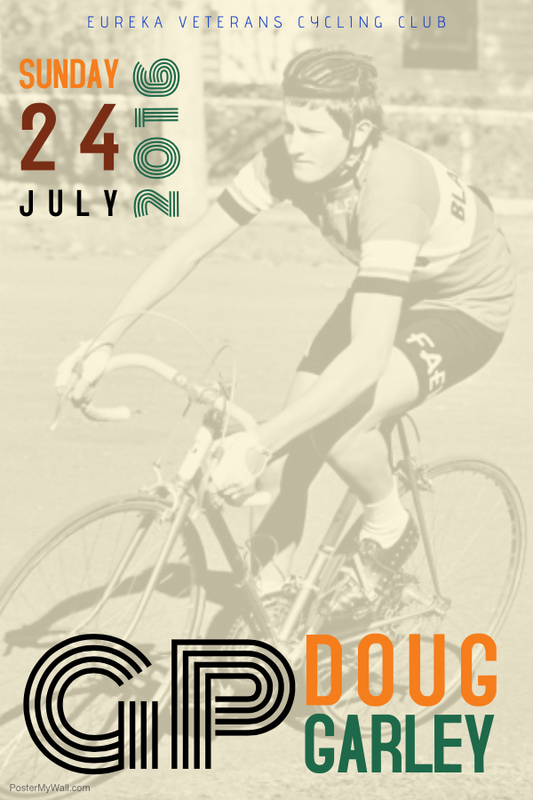 The GP Doug Garley is a special race on the Eureka calendar, held in tribute to and to remember and honour the “Hardman”. Today’s race did his memory proud with true grit on display from the largest field of the year in less than ideal climatic conditions. The story of the race is EPIC. Every bunch splintering – falling to pieces. Only the brave and true – pushing on. In the final analysis, only a third of the field were still in contention into the last lap; one third had pulled out and a valiant one third fought out the race despite having no chance, just to say they had completed the race! Despite his shoulder only being connected to his body by his jersey, and his head being held in place by his helmet, Darren showed no indication of the injuries that he is enduring. He has destroyed many bikes (both pedal and motorised) and which have kept him from racing for most of the year. The top half of his body might be ruined but his legs are rock solid. He exploded out of the blocks and had the rest of the 5:30 minute bunch struggling to stay on his wheel. 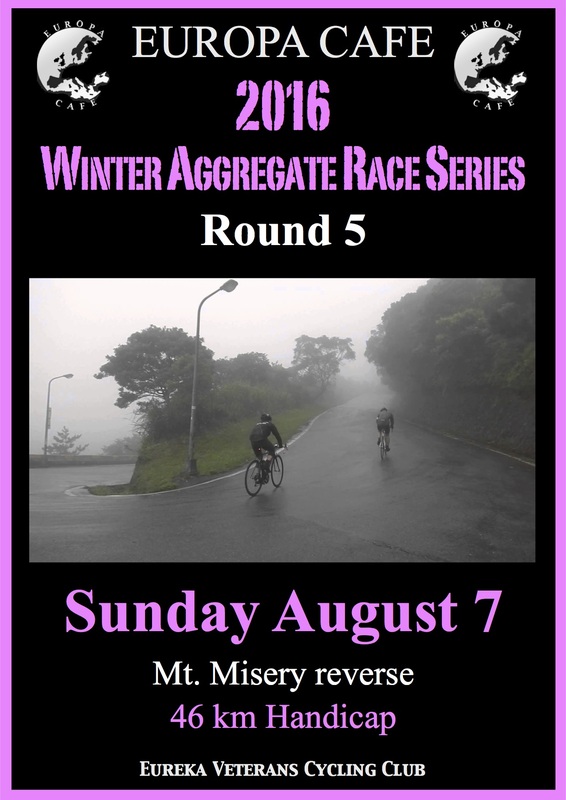 Bob Muncher Morley, Michael Veal and Peter Livitsanis made it over the first hill, but Danny Fidel Whelan wasn’t up to such a savage start and was shelled. Tough nut that Whelan fellow, his race was over in the first km, but he rode out the race and was the last rider over the line – but he did finish! Darren wasn’t looking for any help. and the rest of his bunch weren’t that impressed by the pain he was dishing out! Subsequently they took liberties – “sitting on” while Darren “forged on”. First dash on the dirt and Peter Fifi Livitsanis lost contact on the downhill as the combination of speed, corrugations and a broken elbow had him reaching for the Nurofen. He drifted back through the field and was content to finish but disappointed not to have performed better. Michael Veal (GP Doug Garley winner in 2014) was also suffering, still feeling the exertions from the previous days CX (cyclocross) racing in the muddy back fields of Creswick. He also lost contact and drifted back to find his own way to the finish. Bob Muncher Morley on the other hand, is enjoying perhaps his best season with Eureka. He was on fire and had mastered the required art of the day – hang on to the brutish Darren at all costs. Bob’s strategy was elegant in its simplicity – hang on long enough and Darren would take him to the podium. Meanwhile, Second Scratch were chasing hard, so hard they dropped visiting rider Grant Rogers, and bent Rick Calvert’s wheel. Andrew Sparky Rushton was also shelled. So who exactly was doing the damage? There couldn’t be that many left in second scratch! True, there were only two left – another Bacchus Marsh powerhouse Grant Smokey Dawson and his trusty side kick Peter Kiel were storming towards the front of the race. Despite only being two, their chase looked like being successful, as up ahead they were only chasing pairs anyway. However just as Darren and Muncher appeared ahead, Kiely suffered a puncture. This left only Smokey chasing Darren – and today that wasn’t a contest he could win! So Darren and Bob forged on, Darren starting to believe that history can repeat and that the plate of caramel tarts he’d brought along were going to taste all that more sweeter (if that’s possible). The front of the race had also fallen to bits, Mal Rock and Mandy Ruddick on limit had raced well – especially Mal in his return to racing for a long time. Both riders caught on the last lap but completing the race. The 12 minute bunch of Roger McMillan, James Gretton, Ken Heres and Scott Denno all had the right physique for a race on rough going and all stood up to the challenge well. Both James and Roger were dropped only when Darren sped past – James still finishing in the top 10. Ken (inaugural winner of GP Doug Garley in 2013) elected to stop on the finish line on the bell lap to watch the finish. Scott Denno had other thoughts. He ploughed ahead in a race that suited such powerful riders. He was able to stay in contention for the finish, a great effort from the not-so-big-guy who is returning to form. So on the turn onto the dirt for the last time Scott was caught by Darren and Bob. Darren then shoots clear and was sailing into Eureka history. Bob was pressing for the line and fully aware of Scott on his wheel (for although he was passed he wasn’t dropped). Scott bided his time and waited for the final dash and inevitably out-muscled Bob to grab an impressive second on the line – Bob still delighted to take third in such a prestigious race. Less than 50 metres in arrears was Grant, storming home for fourth. Six in the scratch bunch became four, with Matt Ayres not up to the mark today and yet another misfortune for the seemingly cursed Dean Griffin (he can’t win a trick lately). The remaining four, Dean Wells, Phil Cartledge, Damien Keirl and the in form Greg Ley were undaunted and were still the largest bunch on the road. With a disciplined effort they still had a shot, especially with the field crumbling in front of them. They started collecting shelled riders at regular intervals, which inspired them to maintain their effort, then press even harder when the time gap was called out at the bell lap. An untimely drink break saw Phil despatched in the Avenue as the others surged. The front of the race was tantalisingly close and gradually coming back as the remaining three worked closely in the crosswind. Onto the dirt the last time the lead was out of reach, but they had rolled up and shelled everyone except the four placegetters. In the sprint for fifth and fastest it was always going to be a contest between the sprinting god Damien Keirl and the guy who is best suited for this type of tough uphill grinding finish – the dominant lead out man Dean Wells. In a spirited effort Dean went early, but Damien followed then quickly sprinted clear reigning supreme. At the post race presentations, both Ken and Damien spoke of their great friend Doug Garley. 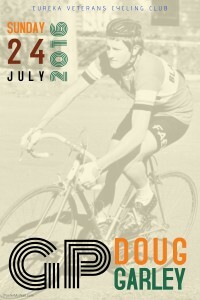 Amongst other cycling feats on road and track, Doug represented Australia in the 80s in a World Championship. The jersey he wore during that time has been framed and will be hung in the club rooms. Thank you to Ken for sharing this memorabilia with the club. Darren is the first rider to have his name on the cobblestone trophy twice. 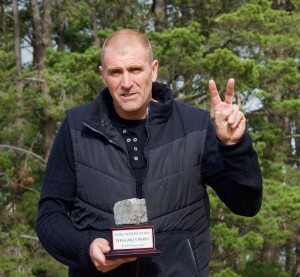 Even though the GP Doug Garley does not include any cobble sectors, the trophy is symbolic of Doug’s revered “hard riding” and feats whilst racing in Europe. Thank you to Michael Veal for the donation of the perpetual Doug Garley “cobblestone” Trophy. Photo: Darren with the perpetual Doug Garley trophy. In what has become his trademark move, Greg Ley (pronounced LEE) risked it all and skipped off the front 1.5 km from home. This time he held off a large chase group, just, to take an impressive win in round 4 of the W.A.R.S. On a grey July morning with a descending fog, a total of 18 riders, including 5 first-year veterans arrived to do combat. A stiff northerly blew across a circuit that is largely north/south…either as a tailwind or a headwind, it was going to be decisive. John Faulkner was first away, this week riding solo with a 15:30 minute head start on the next bunch. It takes a special kind of discipline and an iron will to ride solo with the whole field chasing. John had fully committed to the race, knowing that his chances were almost zero if he got caught. A strong ride from John, on fully inflated tyres, he only came into sight on the climb to the turnaround, by then the whole field was almost on top of him but he had acquitted himself well and should be satisfied with his race. Off 9:30 minute a rag tag bunch of injured old stagers whose baselayers consisted of bandages, voltarin and linament were careful to keep the bunch together for as long as possible until the legs warmed up properly. Birthday girl and this year’s Braszell winner, Jude “Xena” Jonasson continued her run of rare form with yet another head turning performance. Not many can take a 15 minute savaging off their mark and still be competitive! Jude made it look easy though and when the bunch was caught (first by the 7 minute bunch then by the 4 minute bunch) she stepped it up, gritted her teeth and persevered, even working turns, much to the surprise of all. It finally took a sustained 500 kW effort by the 4 minute boys to drop her on the run home. Also performing well was James Gretton. For such a large guy you hardly notice him, smooth turns, no theatrics just a honest racer, doing his bit. The hills and the wind proving his downfall, oh and the chasing bunch smashing their way through. Terry Collie was as frisky as the spring lambs startled in the paddock, eager to roll through and take his turn on the front and springing up the quarry hills, again it was the step up in pace that saw him come undone. The core of this M.A.S.H unit was Scott Denno, Peter “Fifi” Livitsanis and Danny “Fidel” Whelan, tendonitis, broken bones and torn muscles, they were “visiting” the front marker bunch as they return to racing with varying levels of success. Danny fought on bravely but was shelled on the run out to the turnaround and Scott succumbed as the bunch was caught but heroically rode out the race. The crusading Bob “Muncher” Morley and his two acolytes James Knipe and Mark O’Callaghan, were hard at work whittling away the 2:30 minute gap to the bunch in front. Bob was serenely dispensing racing scripture to his two Gregorian rookies, and as thanks for Bob imparting nearly all his wisdom (he’s got to keep some things up his sleeve!) James and Mark responded with a solid and almost disciplined chase. They timed the papal blessing to the last third of Cricks Hill, a turn of holy acceleration ensured that only the strong and the righteous made it to the high alter, by Glendaruel only the meek, bowed-headed Jude and Fifi remained of the 9:30 bunch, the rest dispatched like heathen, strewn back over a kilometre. With Jude and Fifi converted to the new doctrine, the combined five started to work turns to haul in Faulks on the devilish climb to the turnaround. John came and went nearly as fast as the traffic cone at the turnaround. Plummeting down the hill it became apparent that the gaps to the chasing bunches had collapsed significantly and that success was going to depend on a strong tailwind and strong legs. Then divine intervention, the clouds parted and the glorious 4 minute bunch of Rick “Sudso” Calvert, Greg Ley and Peter Kiel descended upon the riders. Demanding nothing less than a sprint from any wanting to stay in the cabal. The energiser bunny Peter Kiel was fully charged today, not only had the three of them caught the front of the race by the turnaround, they had held off a chasing scratch bunch twice the size. Now a Zen group of eight in full chant, with the breath of God solidly behind them, the race was at their mercy. Past the wineries, down into Coghills Creek, the crusaders coursed, they were well clear rounding the right hand corner and continued their charge for glory. Into Donovans Road and Rick, Mark and Greg all surged out of the corner to see who they could catch out. Up the rise at full gas, Rick found that his amplifier does go up to eleven…he attacks and opens a small gap which Mark and Kiely close down. Then the counter attack and yes, Greg had jumped off the front. Kiely wasn’t keen to close this one down too, but nor was anyone else, the hesitation and the tailwind giving Greg the space he needed. Over the top into the downhill race for home and Greg was starting to come back. Then, Rick lit up the sprint (from too far out), the rest of the chasing bunch in various levels of disarray and distress looked certain to contest for the minors only. Greg turned himself inside out to hang on by 10 metres to a fast finishing James Knipe with Fifi sneaking in to pinch third from Bob. Mark was closed out on the inside and had to settle for fifth on the line. Given the windy conditions and the talent listed on the whiteboard, scratch were firm favourites today, and they left nothing in the tank. The first leg breaking lap saw them take a big chunk of time out of the field, however the bunch gradually started falling apart after Dean Griffin punctured less than half way into the race. The extra efforts started to take their toll, resulting in Matt Bowman and then Dean Wells successively succumbing. This left only only Phil Cartledge and Rob Ellis to continue the chase and/or sort out fastest time. The odds were against them with a fair tail wind and the larger combined bunch up the road – but chase they did. A concerted effort saw them both finish within a minute of the placegetters. Phil has developed his sprint in the past couple of years and now trusts it enough to wait, and when the time arrived he opened it up and surged clear of Rob for fastest time. A happy Ley family post race.